Ok, let me just say, we had a bit *too* much fun taking these pictures for Halloween. 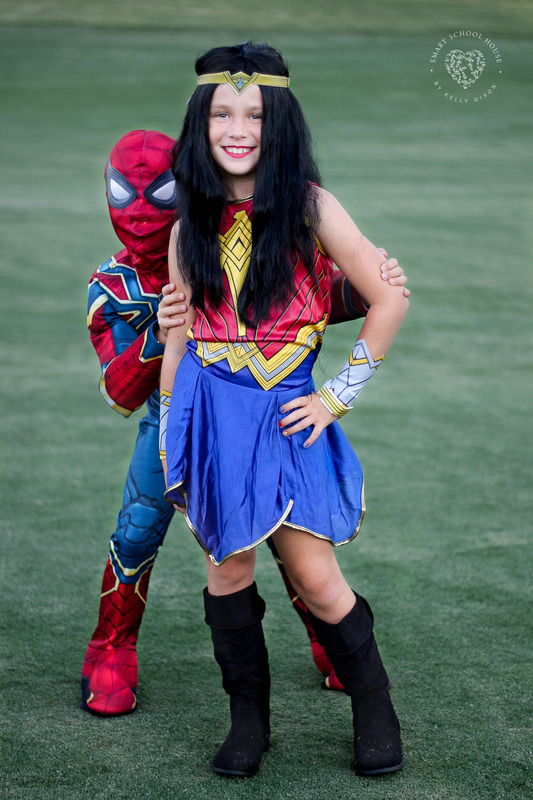 The Superhero Halloween Costumes my kids picked out are so cute! Once they put the costumes on, their imaginations ran wild… we LOVE Halloween! Secretly, I loved that they picked out superhero costumes that match because it doesn’t get any more adorable to me. It’s like they read my mind when picking out perfectly coordinated siblings costumes for Halloween LOL! 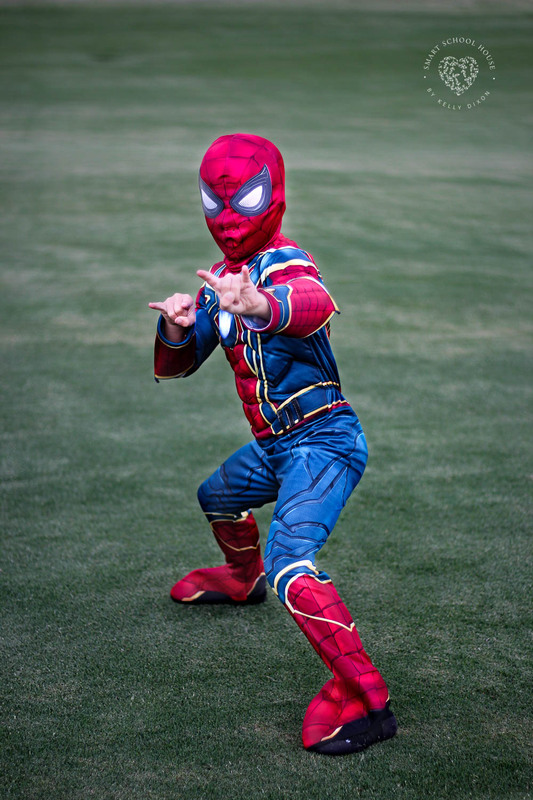 The moment my son put on his Iron Spider costume, he began running around outside, striking poses. Can you tell he’s ready for a big night of trick-or-treating? Best of all, these costumes didn’t break the bank. We found an amazing selection of character costumes (over 90 characters) for just $15 each at Walmart. The kids look SO great in these colorful and imagination filled costumes. 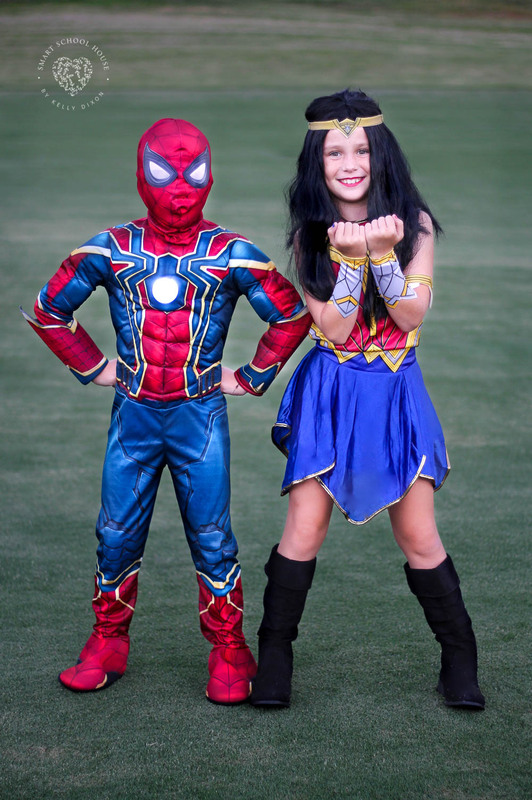 The Iron Spider Spiderman Muscle Costume has a muscle filled chest that makes him feel like he’s the real deal:) Isn’t it fun thinking back to Halloween night when you were a child? The excitement of waiting for the sun to go down, getting in your costume, and then collecting as much candy as your pumpkin pail could hold. As you get older, your parents let you trick-or-treat at more houses and you switch the pumpkin pail for a pillowcase. Do you remember coming home on Halloween night to sort and exchange candy? Those were the days!! It’s even more fun watching our kids experience those things. Seeing the happiness in their eyes and hearing the excitement in their voices is priceless. My daughter also picked out some accessories to add to her amazing little Wonder Woman costume. She also got an awesome black wig and knee high black boots. 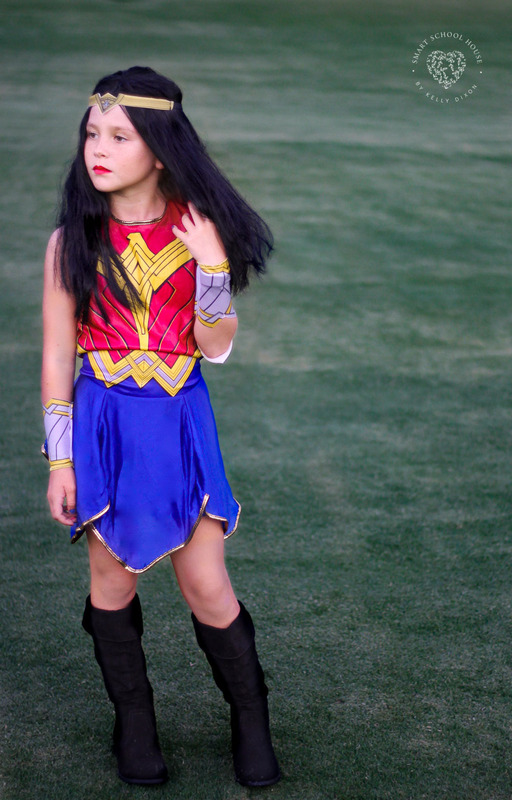 Just for fun, I painted her nails red, white, and gold 🙂 In this costume, my daughter looks just like Wonder Woman: beautiful, fierce, and FUN! Did you know that you can browse Walmart.com for tons of these adorable kids costumes and pick them up in store the same day? That’s what we did! My kids checked out all of the character costumes, I made the purchase online, then we quickly picked everything up after school. It’s so easy and convenient for busy families like ours. Visit Walmart.com to find your favorite character costumes and accessories for Halloween. I love the selection, quality, and value of the costumes they have. There’s something for everyone! We simply cannot wait for Halloween night. What do your kids want to be? Send us pictures of them all dressed up on Facebook or Instagram. I can’t wait to see!